How to add social sharing links with Tripolis Dialogue? 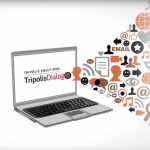 Home » Portfolios » How to add social sharing links with Tripolis Dialogue? Within Tripolis Dialogue you can easily add social media channels as Facebook, Twitter, LinkedIn and Google+ to your email marketing campaigns. This way you can easily share your direct email or newsletter on your social media channels. In the next video above we’ll show you how you can add these Social Sharring buttons and links in your e-mail.